With the weather improving by the day, I was easily persuaded last week to impulse-buy my first ice-cream maker! With some fresh rhubarb in the fridge I decided to take it for a spin and make some rhubarb ice-cream. I wanted to achieve that classic confectionery combination of rhubarb and custard, so found a recipe for a traditional custard-based vanilla ice-cream and adapted to accommodate the rhubarb. Enjoy the recipe below and let us know how it works for you! The first step is to stew the rhubarb . Chop into chunks and heat in a pan with the butter, a tablespoon of sugar (to taste) and a splash of water if needed. Heat until soft, then set aside to cool. 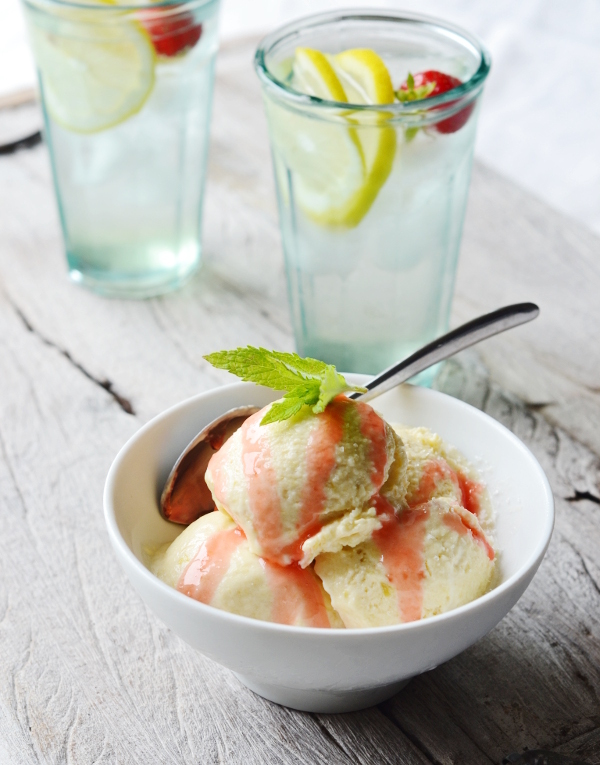 For the ice-cream, warm the milk, cream and vanilla extract over a low heat (do not allow to boil). In a separate bowl, whisk together the egg yolks and 70g of sugar until the mixture turns pale. Off the heat, spoon one ladle of the hot milk into the eggs and slowly stir before adding the remainder of the milk to the egg mixture. Pour back into the pan and heat on a very low heat, stirring continuously. The custard will begin to thicken. When it coats the back of a wooden spoon remove from the heat and cool for at least 4 hours. When cooled, pour the custard into your ice-cream maker or if you don't have an ice-cream maker, put the custard mixture in the freezer, taking out to stir after every 15-20 minutes. When the ice-cream is the consistency of soft serve ice cream, stir in the rhubarb and leave in the freezer overnight before serving. Hopefully this ice-cream will transport you to the tastes of your childhood. I served mine with a quick strawberry coulis made by heating a few strawberries with a little sugar and water and washed it down with some elderflower cordial made by Bethan the day before! Don’t forget there’s plenty more recipe ideas on the Make & Do section of the blog. Are you following @decoratorsnotes on Instagram?